May twenty-second, 2012 may have been one of the five or so most important days for Santa Monica-Malibu schools in the last decade. It was the day that the Santa Monica City Council voted 5-1 to support Agenda Item 8-B and extend the Master Facilities Use Agreement and Related SupplementalAgreements with the Santa Monica- Malibu Unified School District for a term of ten years with a subsequent five-year extension. The item took about thirty minutes from start to finish, however the event that transpired in those fairly undramatic moments solidified a decidedly dramatic sea change in the fabric of Santa Monica politics. The Master Facilities Use Agreement, which provides stable ongoing funding from the City of Santa Monica to SMMUSD schools in exchange for community access to school recreational facilities in off hours, was forged by conflict. In 2004 when the Agreement was first established, the City and the schools were such separate entities that a relationship any deeper than polite acquaintance was controversial. Yet today, the true interdependence between the two is deeply felt. Of course, it is tragic that the State of California has so underfunded its schools and undervalued its youth that it has virtually knocked the State’s educational system to its knees. In decades past, both public education and local municipalities were adequately funded and able to provide residents and students with excellent services and preparation for the future. However, up and down this once-golden state, funding for public education has been slashed, forcing our youth, and ultimately our entire State to pay the consequences. Santa Monica, however, was not about to allow the State’s ongoing crisis to decimate its proudly excellent public schools. The correlation between excellent public education and a strong city was, in the minds of many leaders in our community, undeniable. In the summer of 2003, Community for Excellent Public Schools (CEPS) started discussing an Amendment to the Charter of the City of Santa Monica, which would create an annual contribution from the City of Santa Monica to the Santa Monica-Malibu Unified School District. 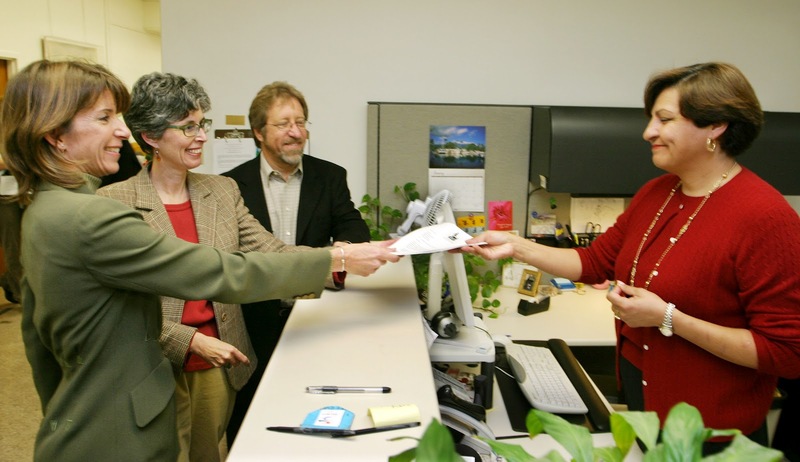 In January of 2004, CEPS filed the proposed amendment to the City Charter, and by May, CEPS had raised over $100,000 and gathered 15,000 signatures to qualify its proposed charter amendment for the November 2004 municipal election. Later that month, then SMMUSD Superintendent John Deasy and City Manager Susan McCarthy reached an 11th-hour compromise agreement -- the Facilities Use Agreement. After much political wrangling, heated debate, and raised tempers, all parties signed off on the agreement, including CEPS, the SMMUSD Board of Education, the Santa Monica-Malibu Council of PTAs and, of course, the Santa Monica City Council. CEPS agreed that it would not turn in its signatures and the Charter Amendment was not placed on the ballot. “CEPS is also extremely grateful to the City Council for its willingness to create this compromise in 2004. Since that time, we have seen the relationship between the schools and City leadership warm considerably into the proud partnership that exists today, and this renewal of the agreement as proposed by City Manager Gould and his staff is great proof that the partnership is mutually beneficial for both our schools and City. So many leaders have courageously stepped forward to support the partnership between the schools and the City. CEPS feels strongly that both the City of Santa Monica and its schools are strengthened by this strong and enduring partnership. The skies on Sacramento’s fiscal horizon continue to darken, threatening not only schools, but municipalities, and services for everyone in need. Only by joining together locally, will we weather these storms and succeed in protecting all residents and students from what will almost certainly be ongoing and, even increased hardships coming from Sacramento. Thank you to the Santa Monica City Council, City Manager Rod Gould, the Santa Monica-Malibu Board of Education, Superintendent Sandra Lyon and an army of education, business and community leaders for helping make this partnership a reality. 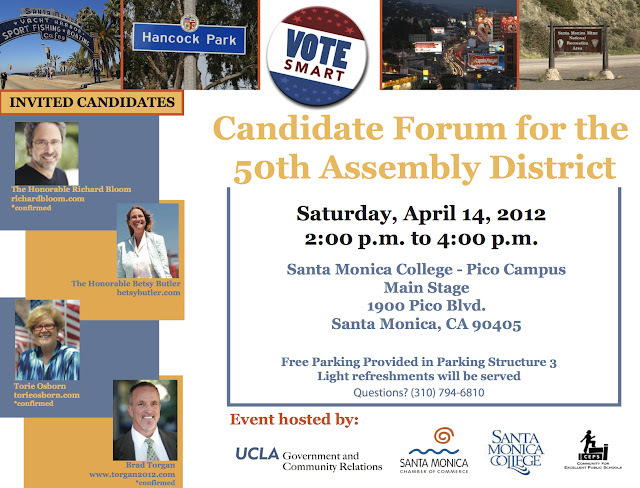 We hope you can attend the 50th Assembly District Candidates Forum which CEPS is co-sponsoring with Santa Monica College's Public Policy Institute, UCLA and the Santa Monica Chamber of Commerce, on Saturday, April 14th from 2 to 4 p.m. on the Main Stage at the Pico campus of SMC. November's election will be so important to each of us on a local, statewide and national level. Please learn as much as possible about the issues and candidates vying for your vote -- and vote smart! CEPS is proud to co-sponsor this event and plans on providing information with an education perspective to voters throughout this election season. We hope to see you on Saturday. It promises to be a great afternoon! The seventh annual State of Our Schools community report took place this Monday and Tuesday in Malibu and Santa Monica. Superintendent Lyon along with district school principals addressed a record number of community members and civic leaders providing a comprehensive look at our schools and their successes and challenges. In addition, Superintendent Lyon provided a full report on student achievement, programs, and the latest picture on school funding. Check out this great article about State of our School from Ashley Archibald ad the Santa Monica Daily Press. VIRGINIA AVENUE PARK — School officials praised hard-working teachers, dedicated parents and a "unique" relationship with City Hall for the continued success of the Santa Monica-Malibu Unified School District despite budgetary pressures from the state and other outside forces. A record number of parents and community notables turned out for the third annual State of Our Schools event, which highlighted improvements in test scores and student preparedness alongside a general uncertainty about the district's financial future. According to numbers provided by Superintendent Sandra Lyon, overall student achievement in the district continues to outpace the state average, with scores consistently on the rise since 2007. The district also can boast far higher percentages of students passing the high school exit exams and Advanced Placement tests, which are exams given at the end of college-level courses offered in the local high schools. Last year, 478 attended four-year universities, and 338 graduating seniors went onto two-year community colleges. That success comes with the lowest revenue limits the district has seen since the 2005-06 school year, staff reductions, class size increases and promises of more on the way. "We do more with less," Lyon said. "It's not hyperbole. It's fact." California lags behind almost every other state in per-pupil spending. The state contributes $8,908 per student compared to the average $11,764 across the rest of the nation. Devastating cuts from the state level resulting from brutal budgets and a down economy have slashed at core services, ending in growing class sizes and fewer programs. Local funding sources shielded SMMUSD from the worst of the cuts weathered by other local districts. Community for Excellent Public Schools, a local group of school advocates, rallied support for a number of successful funding efforts, including parcel taxes that raise $10.7 million annually and Proposition Y, a 2010 ballot measure which will raise at least $5.5 million for the district this year. Overall, the district receives $32.7 million from local sources, or approximately 29 percent of its funding. "The relationship between (City Hall) and the district is unheard of in other communities," Lyon said. More cuts loom on the horizon if Gov. Jerry Brown fails to convince Californians to pass a sales tax increase and income tax hike for those making over $250,000 on the November ballot. The uncertainty makes it difficult, if not impossible, to adequately plan, Lyon said. "We plan for the future and hope for the best, and everyone knows that hope is not a strategy," she said. The district is looking at a $5 million deficit for the current year, rising to over $6 million in 2012-13. If the tax doesn't pass in November, that jumps to $10.7 million. The Board of Education and administration have made deep cuts at the district office to keep reductions as far from the classrooms as possible, said Board President Ben Allen. More will be necessary to close the existing deficit, a hard thing to balance when over 80 percent of costs come from staff. The district faces many challenges other than cash flow moving forward. Although there's been improvement, the gap in test scores and achievement between students of color and their white and Asian counterparts remains vast. Schools receiving Title 1 funds from the federal government have been pushed to the brink of "program improvement" requirements, which restrict local controls. An acrimonious debate over a new fundraising model which aims to end parent-funding of school programs soured relations between residents in the city of Malibu and the district, and a movement to secede from the district was backed by the Malibu City Council. County officials will provide an update on the progress of that petition at the beginning of March, said Jan Maez, the district's chief financial officer. 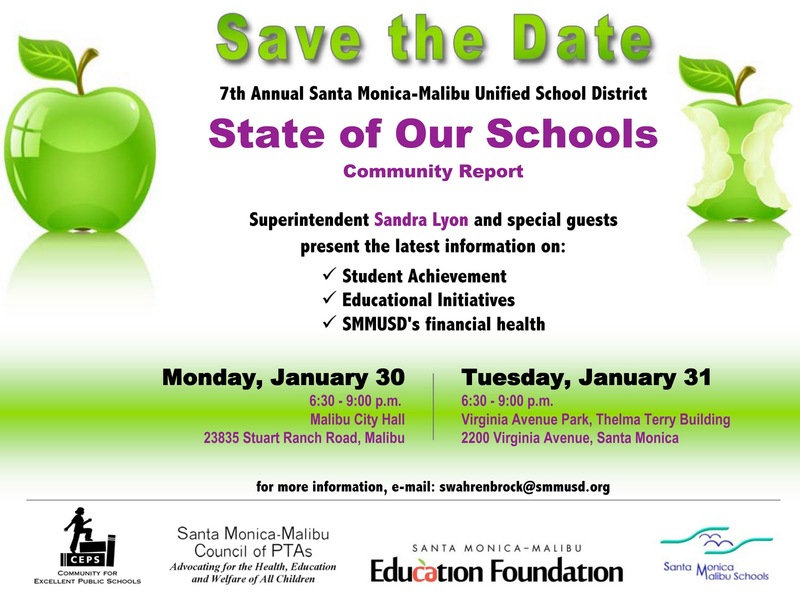 On January 30 and 31, SMMUSD will once again partner with the Santa Monica-Malibu Council of PTAs, Community for Excellent Public Schools (CEPS), and the Santa Monica-Malibu Education Foundation for the Seventh Annual State of Our Schools, a community report on Santa Monica-Malibu Unified School District student achievement, initiatives, and financial health. This year’s report will feature the very latest news and information in a comprehensive report from Superintendent Sandra Lyon about the ever-changing financial picture for SMMUSD in light of recent budget announcements from Sacramento. Ms. Lyon’s State of Our Schools presentation will also provide a report on student achievement and District initiatives to help students succeed. In addition, school Principals will report on innovative educational programs and initiatives that help students make successful transitions to their next grade level. 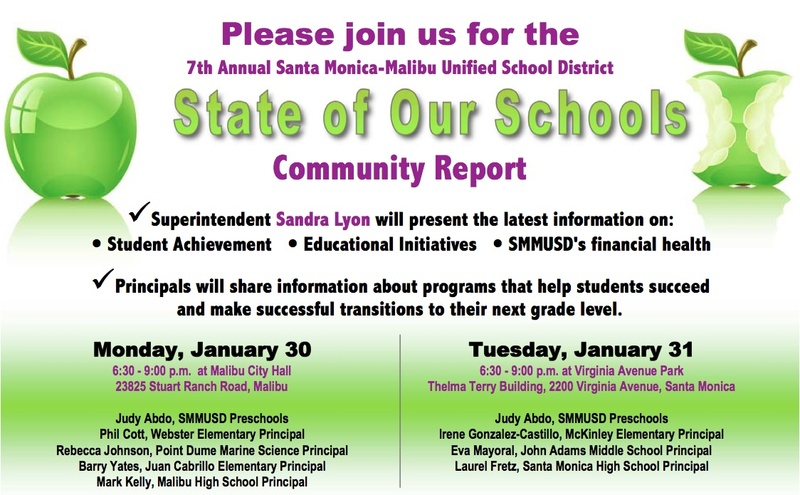 At the Malibu event on January 30, all Malibu Principals will present; Phil Cott from Webster, Rebecca Johnson from Point Dume Marine Science, Barry Yates from Joan Cabrillo, and Mark Kelly from Malibu High School. At the Santa Monica event on January 31, Irene Gonzalez-Castillo from McKinley Elementary, Eva Mayoral from John Adams Middle School and Laurel Fretz from Santa Monica High School will make presentations. Ms. Judy Abdo will speak at both events about the SMMUSD preschool programs. Each event will also feature musical entertainment from student performers. These educational forums are free and open to all members of the public. Spanish translation is available and light refreshments will be served. With 2011 finished and 2012 starting to wake up, Community for Excellent Public Schools looks ahead to another critical year for public schools advocacy. Local and statewide education advocates took a wild roller coaster ride in 2011, facing the prospect of deep cuts and 11th hour reprieves to education funding on a regular basis. We saw headlines like State faces midyear cuts, more budget strife ahead, and Schools Had to Make Do With Less. Due to SMMUSD's excellent financial planning and critically needed local revenues, our local schools were able to weather State funding reductions this year and look poised to do the same in 2012 without significant cuts. However, the future could not be more uncertain for public education, both locally and statewide. For that reason CEPS knows that the elections in November 2012 could be among the most important in recent memory. We have been working hard to put the structure in place to help inform voters about issues and candidates as they relate to public schools. 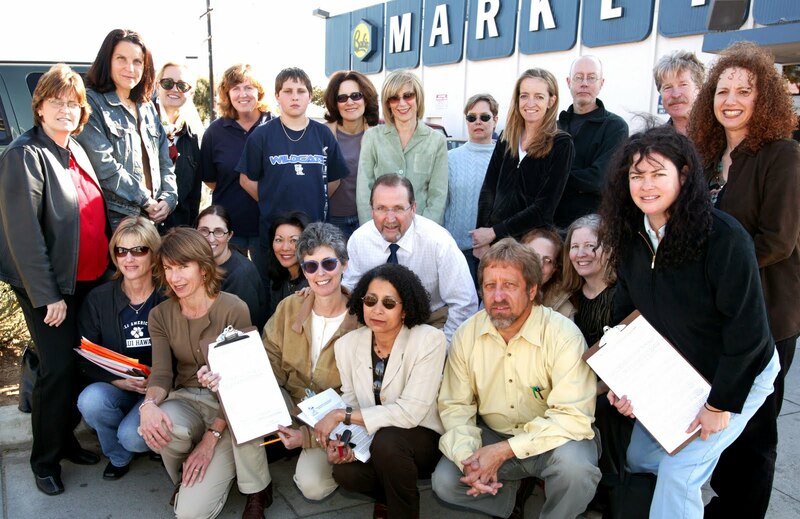 Early 2011 saw CEPS leadership providing input to Santa Monica City and Santa Monica Malibu Unified School District on the mechanics of implementing the recently passed City Propositions Y + YY. These propositions, passed by 61% and 68% of Santa Monica voters on November 2, 2010, implemented a .5% transaction and use tax within Santa Monica and then indicated voters’ desire that half of the new revenues generated by Proposition Y be directed to local SMMUSD schools. CEPS leadership had been very involved in the Yes on Y + YY campaign and were thrilled by its passage and subsequent implementation. In June, CEPS welcomed back its former Chair Shari Davis as Co-chair. Shari had taken a temporary leave from CEPS leadership to serve a distinguished term as President of the Santa Monica Malibu Council of PTAs. CEPS was happy to loan Shari to PTA for a short time, and is even more pleased to welcome her back. As the school year started, CEPS partnered with SMMUSD’s new Superintendent Sandra Lyon and PTA to plan the 7th annual State of Our Schools event. 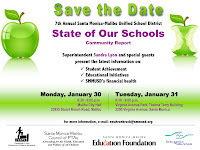 This year, new sponsoring partner, the Santa Monica Malibu Education Foundation joined the planning team. The events will take place this month! January 30th in Malibu and January 31st in Santa Monica. Click here for details. 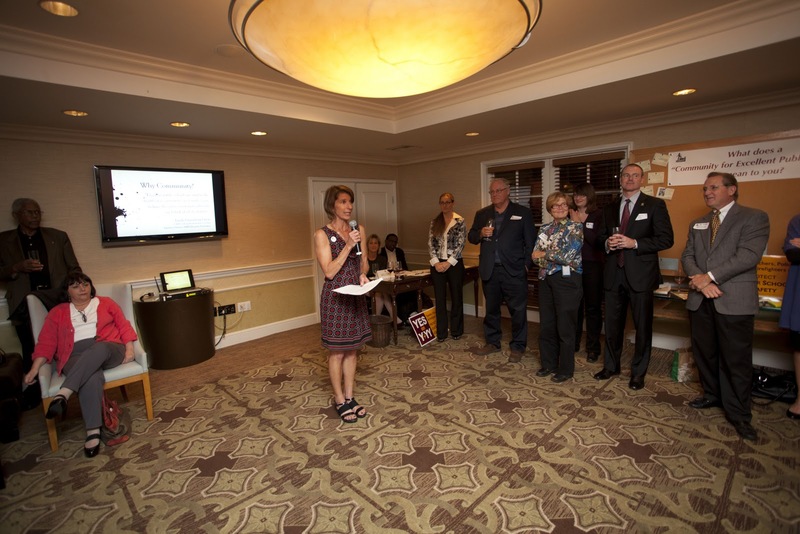 In November, CEPS celebrated the one-year anniversary of the passage of Propositions Y + YY in a wonderful event hosted by the Santa Monica Miramar. The focus of this event was to celebrate and reinforce the importance of City-School partnerships, particularly as so many of the cultural and financial objectives of both institutions intersect. CEPS has had a busy 2011 and expects an even busier 2012. We thank you for your for your support and involvement, and hopes to see more of you in 2012 as we work together to preserve and protect our excellent local public school. Please visit us at www.excellentpublicschools.org to become a member of CEPS and make a contribution to help keep Excellent Public Schools a priority in Santa Monica and Malibu. Community for Excellent Public Schools wishes all of our friends and members very happy holidays. CITYWIDE — The scalpel of state budget cuts continues to slice away at school districts in Santa Monica, but prior planning will shield both K-12 and community college students from the worst, officials say. Gov. Jerry Brown announced in a press conference Tuesday that state coffers were short approximately $2.2 billion in anticipated revenues, triggering $102 million in cuts to the community college system and $79.6 million to primary and secondary education. "That's where we are today," Brown said. "Cuts to university, in home supportive services, schools and prosecution are not good. This is not the way we'd like to run California. But we have to live within our means." The cuts were built into the budget, and would only be "triggered" if approximately $4 billion in hoped-for revenue failed to appear. The triggers came in two tiers — higher education and other social services would be cut first, and, if less than half of the expected money came in, K-12 education would feel the knife. While higher education will feel the full brunt of the loss, K-12 will only lose $79.6 million of the $1.5 billion it faced, said Ana Matosantos, director of the state department of finance. The cut could equate to half of the transportation budget and approximately $13 dollars per student in state funding, said Jan Maez, the chief financial officer of the Santa Monica-Malibu Unified School District. That's fabulous, considering that it could have been 20 times that amount if the state hadn't realized any of its projected revenue. "Months ago, we heard it would be $181, and we thought that was good news," Maez said. "This is even better news." The district set aside money to cover potential losses in January, so students will not see any change in services this year, Maez said. Subsequent years, however, remain a mystery. Unlike K-12 education, the state college and community college systems and other social welfare programs were promised a $601 million reduction if the state fell short by $2 billion. Santa Monica College officials put aside $1.24 million from its $12.6 million reserves to help weather the cuts, said spokesman Bruce Smith. "We have a strong reserve, and thank goodness because with all of the cuts year after year after year, it's been difficult," Smith said. The newest round of reductions brings cuts in the 2011-12 school year to $502 million for the community college system alone, said Paige Marlatt Dorr, spokesperson for the California Community College Chancellor's Office. In an attempt to offset some of those losses, state officials imposed a $10 increase per unit on community college students earlier in the year. The newest triggers will mean another $10 increase, raising the per unit cost from $26 to $46. "That's a 77 percent increase in fees in less than a year," Marlatt Dorr said. "We serve some of the most vulnerable and needy students in the state. We are still the lowest, but for many of our students who are working two jobs, they're barely making it paycheck to paycheck." The new revenue won't appear until fall 2012, however, and some community colleges will still have to cut class offerings and, in some cases, personnel. That's not the situation at SMC because of careful money management and a higher population of out-of-state and international students that pay higher fees than California students, Smith said. "We have actually hired some new tenure track faculty," Smith said. "At the same time, don't get me wrong, this isn't good news." And the bad news could keep coming. In his speech, Brown promised another round of cuts if Californians vote down a tax measure meant to raise $7 billion, which will appear on the November 2012 ballot. "Trigger cuts are a process of fiscal discipline. Going forward, we'll have an opportunity in November to vote in the revenue, almost $7 billion, or not," Brown said. "If they do, taxes will be extended for the next few years. If they don't, we'll see even bigger cuts." CEPSNEWS is the ongoing newsletter from COMMUNITY FOR EXCELLENT PUBLIC SCHOOLS (CEPS) -- an interactive forum for sharing information and commentary about Santa Monica - Malibu public schools. CEPS is dedicated to the preservation and betterment of public schools in the Santa Monica -Malibu Unified School District. ==>	To promote accountability for high quality public education by public institutions and public officials.